In the move towards workplace gender equality, progress is moving glacially slow on many key measures. Is that the way it has to be — or are we just making excuses? In 2017, the World Economic Forum predicted we’d be closing the economic gender gap in 217 years — 37 years longer than the estimate they provided in 2016. It wasn’t, unfortunately, that surprising; in many key measures, from workforce participation to the gender wage gap, we haven’t moved the needle significantly in two decades. Which leads to the question: Why is our progress towards workplace gender parity so slow? We could argue that there are a lot of reasons. Or we could recognize that these are just excuses, and start moving towards change. Excuse #1: The issue is embedded in our culture, and we can’t change culture that quickly — it takes generations. Let’s step away from gender equality for a moment and look back at the technological developments of the last two decades. Google officially launched in 1998, revolutionising our ability to access information — and having a measurable impact on how our memory functions as well as our reliance on each other for storing knowledge. The integration of social media into our daily life, from Facebook (2004) to Twitter (2006) to Instagram (2010), has transformed how we interact with each other and the world around us, how we create and maintain relationships, and how we view and document our personal experiences. The adoption of the smartphone, coupled with the ubiquity of an internet connection, has changed how, when, and where we work and play — as well as our balance between the two. Yet, in the same 10 years that I transitioned from a rarely-charged flip phone kept in my glove compartment to a smartphone that I treat like an appendage and use like a mobile office, the World Economic Forum’s global economic gender gap narrowed by just 3%. In 1994, when Netscape Navigator began fighting for browser dominance with Internet Explorer, full-year, full-time female workers in Canada were making 73 cents for every dollar a man made. In 2014, that number had only reached 74 cents — despite women surpassing men in education achieved. And starting in 2017, the #MeToo movement has not only shown us that workplace harassment is still pervasive and damaging, it has also highlighted how we’ve spent the last twenty years punishing victims for coming forward, rather than their perpetrators. How are we capable of effortlessly evolving so rapidly in some aspects of our culture, and stall so spectacularly in another? It is apparent we can handle massive change in 20 years, rather than 217. The question becomes how we make it happen. Excuse #2: The problem is huge and complex — solving it will take a long time. Yes, the problem is huge. It encompasses a multitude of issues, from the gender wage gap to the lack of women on boards to how we value care-giving. And while some countries are better off than others in a few of these areas, economic inequality remains a global phenomenon. Yes, the problem is complex. There are a number of interwoven factors that feed into it, from a lack of sponsorship to limited visible role models to unconscious bias. We may not have a simple solution to address the whole problem, but we have proven strategies to focus on its parts. Take Women of Influence, for example. 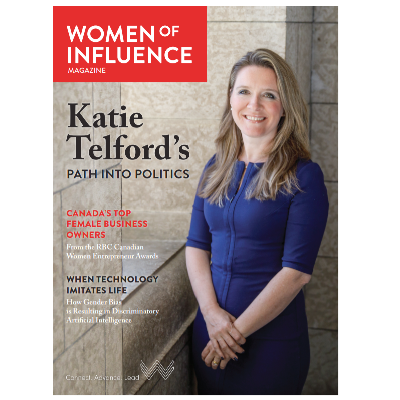 Not enough female role models are given the opportunity to share their insights, so we give them the podium, and write about their stories of success. And you don’t need to be an organization dedicated to women’s workplace equality to follow the same principle. In January we partnered with Catalyst Canada on the first annual Radical Change Summit, which brought together business leaders who had taken a leap forward in gender equality, rather than a small step. They discussed not only their successes, but also how they achieved them — with the goal of inspiring others to take similar action. There were many valuable insights shared, and a notable theme tying them together: a planned and determined focus addressing specific issues. Excuse #3 – We can’t get people on board for progress. Convincing one person to join the cause is doable, right? From the business case to the moral imperative to personal life experiences (men get less sexist when they have daughters, for example) — there are countless ways that skeptical or reluctant individuals become supporters and advocates. If we can get organizations to change, what about an entire industry? We have a very recent example that shows how possible it can be: The impact of the #MeToo movement has only just begun, and it has already pushed the conversation into the mainstream, taken down high-profile perpetrators, forced organizations to rethink policies, and men to rethink their actions. Yes, there has been backlash, but that doesn’t mean we should be halting progress. Excuse #4 – Change is painfully hard, so we need to go slow. Our opening keynote speaker from the Radical Change Summit — Blake Irving, director and former CEO of GoDaddy — informed the crowd that “The status quo does not go down easy.” He should know: When he took the helm, GoDaddy was best known for an advertising strategy that many viewed as sexist, if not misogynistic, and the company culture was just as in need of an overhaul. He led the transformation of the organization — inside and out — into one of the most inclusive in tech. And he did it in five years. Not all men recognize that there’s even an issue, so it’s not surprising that they’re resistant to change. I think it’s about time we accept the fact that this isn’t going to be comfortable — at least not for the currently advantaged groups — and that’s okay. We can move forward, and we can move forward quickly, if we stop using the challenge of change to keep us from making it happen. Let’s make 2018 the year we forget the excuses, and get the job done.